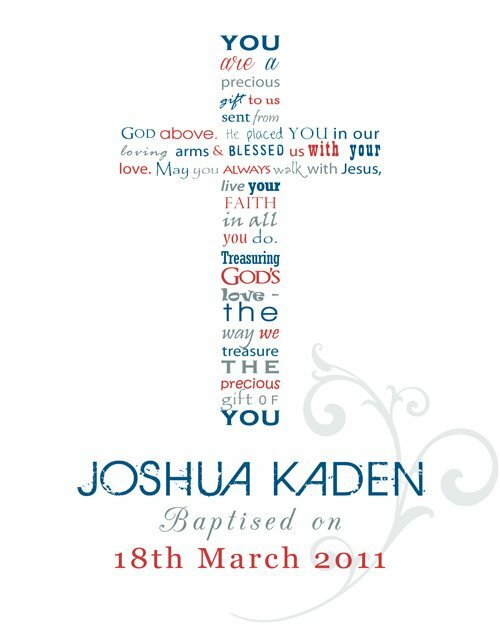 Personalised Word Art framed prints are unique and sentimental - just perfect for baby's Christening or Baptism. This beautiful cross-themed Framed Word Art makes a thoughtful gift and keepsake that will be treasured for years to come. Decide on a colour theme, tell us your personalisation details and we’ll create a superb, quality piece of personalised art. "You are a precious gift to us sent from God above. He placed you in our loving arms and blessed us with your love. May you always walk with Jesus – live your faith in all you do. Treasuring God’s love - the way we treasure the precious gift of you." Australia: $15.00 – Express Post, no signature required on delivery. A business address is encouraged. PO Boxes ok. PLEASE NOTE: Photographed framed picture above is a SAMPLE - indicative of the matting and frame only. Photographed artwork may not correspond with the artwork of this specific product.